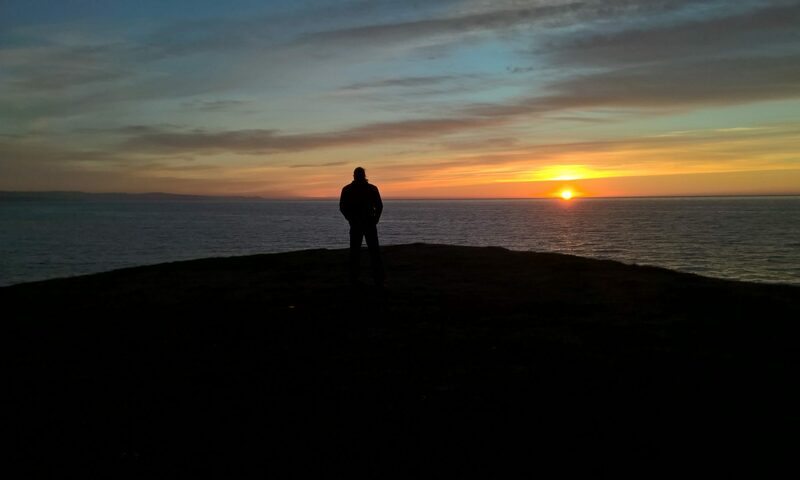 I am building an asp.net website that communicates with NAV via Web Services. One of the issues I had to solve was the authentication between the web and the NAV Web Services. You can ether use NTLM authentication or the current user. If you will be using NTLM you will need code similar to this in you website. 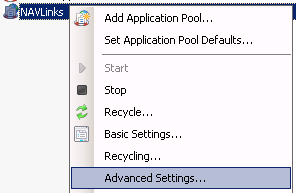 Then go and select this Application Pool for the web site. The final step is to make sure that the user you select in your code or in the application pool has access to NAV Web Services. 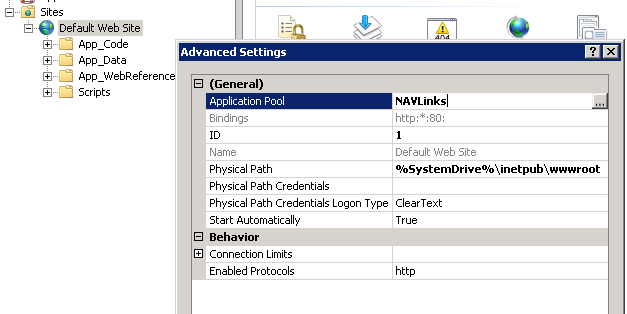 That is done with the standard authentication methods in Dynamics NAV. 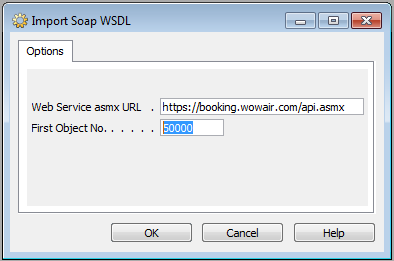 On several occasions I have needed to create a code to communicate with Soap Web Services. The manual labor in creating the functions and XML Ports is something that I would like to be rid of. On that node I created a Batch that does most of the job for me. Execute this and you will be asked to save the “Web Service Objects.txt” file to your computer and from there you will be able to import the file and continue the work. You will get XMP Ports for every method, both the request and response. You will also get a Codeunit with a function for every method and the necessary functions to handle the web service communication. What is left is for you to connect your data to the functions and the XML Ports. This is not fully tested, so any updates would be appreciated. To save concurrent uses in NAV it might be a good idea to kill idle connections automatically. 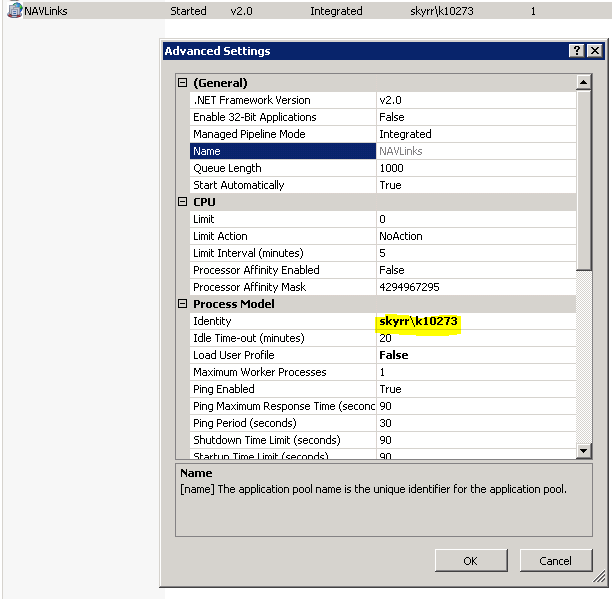 This can be done by looping through the Session Virtual Table and check the Idle Time field. I like to add the field “Maximum Idle Time” to the User Setup table and compare that field to the Idle Time in the Session table before deciding to kill the session. The use running this batch must have permission to kill sessions on the SQL Server. This can be added as a Job Queue Batch. See here to check for required permission to use the kill statement. 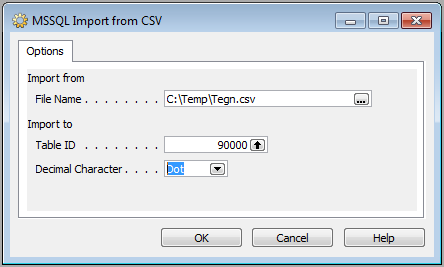 In the process of importing data from MSSQL into NAV I needed to import a comment text. I wanted to import the text into the Note BLOB field in the Record Link table. It was not obvious how to do this but after some work I successfully imported all my comments. After my first round I found out that I needed to include the length of the Note as a Char in the beginning of the note. Then I noticed that my Icelandic characters where not correctly imported and after some study found out that the content of the BLOB needs to be UFT-8 encoded. This led me to create the Text2NoteText function. The MakeVars function creates the NavStr and AsciiStr that I need for the conversion. This is similar to function InitCharTables in Codeunit 424 except I am not using Excel to convert the strings. Attached is a codeunit with these functions. I wanted to be able to use the Record Link table in NAV to link to my attachments. Since that part of NAV is not customizable every attachment that I link to NAV needs to be accessible via URL. So, when I import or scan a file into NAV it can be stored in a BLOB or I can store it in a customized external database. After storing the file I create a URL link to that file and insert that as a new link to any record in NAV. To complete this task I created a NAV Web Service that delivers the file as a base64 string. Here is the part of the code that encodes the BLOB stream to a BigText variable. Then I created a aps.net website that can get the document both from this NAV Web Service and also from the customized database all based on the parameters passed with the URL. Attached is a part of the NAV code and the website required to deliver the attachment.